This gateway is powered by an Intel® Atom™ dual core E3826 1.46GHz processor formerly called "Bay Trail-I". 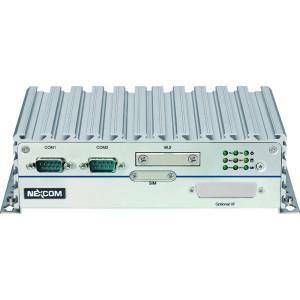 It provides on-board 4GB DDR3L 1066/1333 RAM and 32GB EMMC Storage Device. 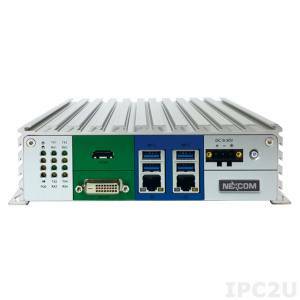 The Input/Output connectivity of this gateway is presented by: 1 x SIM Card holder, 2 x Intel® I210AT GbE LAN ports ( support WoL, teaming and PXE), 1 x HDMI display outputs, 3 x USB 2.0 (500mA per each port), 3 x COM ports (COM1 supports full RS232 signal, COM2 offers Tx/Rx/GND, COM3 is a RS2422/485 interface with auto flow control) and 1x line out. The NISE-50-4G-32G gateway also supports optional 3x mini-PCIe modules that can be used, for instance, for wireless connectivity, such as Wi-Fi, Bluetooth, 3.5G and 4G LTE. There are 2x antenna holes for optional Wi-Fi/3.5G antenna. The NISE-50-4G-32G has the metal chassis with fanless design, -5..55˚C operating temperature range and 24V DC power input. This device is certified for compliance with FCC Class A, CE and UL/cUL standards. The NISE-50-4G-32G offers a lot of actual solutions for manufacturing, trade industry and other sectors. At the factory it can help to gather data from the sensors, deployed at the production lines and send this data for further analysis to cloud platforms, such as IBM Bluemix®, Microsoft® Azure™, SAP HANA® etc. This data can be useful for engineers for equipment failure prediction, prevent downtime and finally save money for owners. This gateway also can be used for centralized monitoring and control of access and surveillance systems, lighting and other systems of smart house. Having powerful Intel®-produced CPU, a variety of I/Os for data collection, NISE-50-4G-32G allows to build end-to-end connections between field devices and cloud services. NEXCOM IoT Studio is also available to help users deploy NISE-50 gateways, thus implement completed IoT solutions. 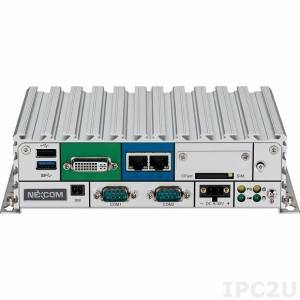 So, NISE-50-4G-32G is an up-to-date device and modern solution for intelligent systems such as a factory automation or smart city controller and gateway.